Triple layers of snow filled fun with your favorite character Olaf from the Frozen movie. Have Olaf around for all the Winter fun and hope he doesn't melt in the Summer! 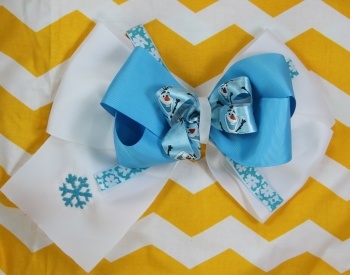 The bottom layer is a 4 inch white grosgrain ribbon that has a turquoise snowflake on the tail. Then a 2.25 inch turquoise ribbon is in the middle and then topped off with a satin turquoise ribbon with Olaf on it. Olaf's fun smile is sure to be a winner for your little girl. Wrapped up with a white grosgrain ribbon and attached to a French clip.